we are leading manufacture of Hand Lever Cage Clamp. • Available in sizes 6 – 60 pipe diameter. We are counted amongst the outstanding External Clamping Set manufacturers in India. The clamp set offered by us is ideally designed to meet the requirements of the clients. We are engaged in manufacturing and exporting a wide range of External Pipe Alignment Clamp. These clamps are tightened with the help of hydraulic jack and can be easily aligned up t any required degree for use. Available in customized specifications. 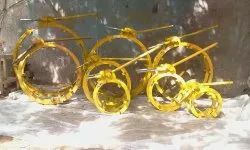 With Hydraulics cylinder and oil pumps. · Tighten with hydraulic jack. · Easy to use for alignment. · Available in sizes from 16 to 64. 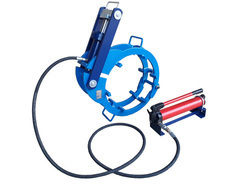 · All Hydraulic Line up Clamps are precision fitted to the proper specifications to insure proper alignment and quick clamping with a convenient hand lever and hydraulic jack for quick line-up of the pipe. We are engaged in offering External Clamp. Our external clamps are available from the 4 to 60. The clamps are fabricated with quality workmanship & material which results in powerful clamping & accurate alignment of joints. Hand lever type, ratchet type & hydraulic jack type options are available.